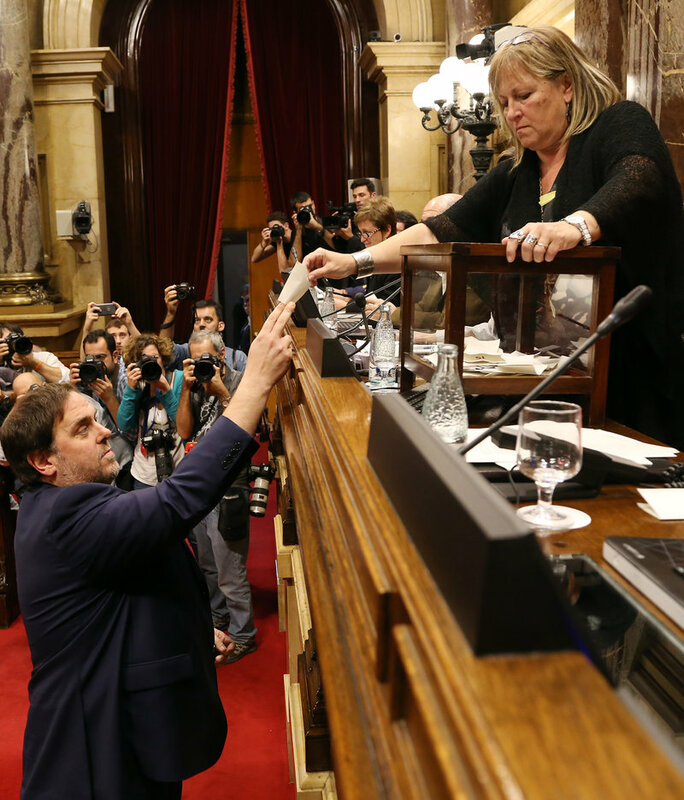 Junqueras voting on the declaration of independence. A.P. Just over a year ago, the Catalan Republic was proclaimed on October 27. The proclamation was valid according to international law, being made by the majority of a democratically elected parliament after a referendum on self-determination in which up to 90% of the votes – of those that could be counted, given the brutal aggression from Spain’s police forces – were for independence. It was an important stage in the struggle for national liberation after more than 300 years of oppression and Catalonia’s semi-colonial status within the Spanish state. More or less time has passed in many historical secession processes between the proclamation of independence and its coming into effect and getting international recognition. In fact, the main reason that the Catalan Republic has not become effective yet has been due to the aggressive, revengeful reaction from Spain, which has imprisoned political and social pro-independence leaders and forced others into exile. This reaction also shows that the proclamation was more than just a symbolic act. It must be remembered that Spain does not recognise Catalonia’s right to self-determination, unlike the UK with Scotland, despite having ratified the Charter of the United Nations and the international covenants in which this right is enshrined. And the Spanish Constitution itself, in Article 96, obliges respect for ratified international agreements. Therefore, the conflict between Catalonia and Spain cannot be considered an internal problem with regards to the Spanish Constitution. At the beginning of November, Spanish prosecutors demanded a total of 177 years in prison for the nine jailed Catalan leaders, with up to 25 years demanded for Catalonia’s former vice president. These abusive penalty demands contrast with resolutions by courts in various European countries, which denied extradition requested by the Spanish courts for ex-members of the Catalan government in exile, precisely for the very same reasons. To this has been added more recently the imposition of an exorbitant fine of €4.9 million on former members of the Catalan government for organising a democratic consultation on the future of Catalonia on November 9, 2014, preceding the democratic binding referendum on October 1, 2017. And there is much more to Spain’s democratic malaise. Let’s take just one point: Spain’s current Minister of Foreign Affairs, Mr. Josep Borrell, was last October found guilty of insider trading in a matter concerning a sale of Abengoa shares, when he was occupying a relevant advisory role in the firm. However, in the Spanish Parliament, the corrupt PP party joined sides with the ruling PSOE party to prevent a parliamentary rebuke. Catalans are thankful for the solidarity shown by parliamentarians and the defenders of human rights from a number of different countries. They must also be thankful that, after a campaign from Spanish media about Russian interference in Catalonia’s independence process, a report by the British parliament in April clarified that this was a blatant case of fake news. The purpose was to cover up Spain’s brutal repression of its national Catalan minority with a supposed fight against the mighty Russians. The European Union has begun a procedure against Poland and Hungary on violation of the European Union’s foundational values. Hence, according to these same standards, it is difficult to understand why this has not also been done against Spain. As we have seen, Spain has gone even further in the violation of human rights, by maintaining political prisoners and exiles for over a year, and is immersed in a drift towards neo-fascism.